A new article by the WND Diversions has been trending in Kenya after it linked US president Barrack Obama, to devil worshipping after an image of what looks like a demon appeared when he was shaking hands with President Uhuru Kenyatta and other leaders on arrival to Kenya. According to the WND there was a strange image that appeared across the screen as he was greeting President Kenyatta at JKIA and this was his demons following him whenever he went. They say that the mysterious creature was brought their attention by a concerned American lady who said that she actually saw a demon run across the screen and decided to tell her husband. “My husband and I were watching this and I told him I saw a demon run by. He didn’t believe until I rewound the video. Please take a look!” She said. 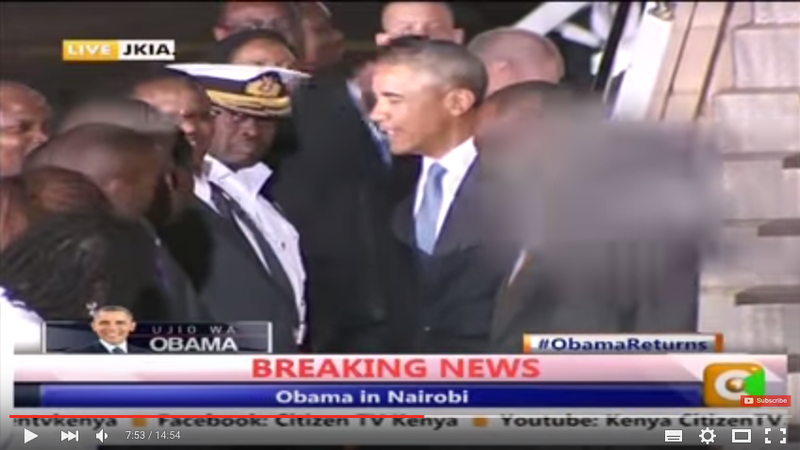 Here is the video below aired on Citizen TV and see the alleged demon that appeared across the screen as Obama was exchanging pleasantries with Kenyan dignitaries. Here is the Video, Head over to 7:50 to see it.